We are part of the worldwide Open/Christian Brethren movement which did so much to rediscover the power and simplicity of “church:” as the one body of Christ and its multiple local expressions. In some countries, these local churches are vibrant, strong and growing; in others they have been seriously weakened, are low in confidence and, in many cases, struggling with terminal decline. Many recognize that the development of new generations of well-prepared spiritual leaders will be a key factor in future renewal. “Biblical Training for growing Healthy churches” is, therefore, a theme that is relevant to all of us. The main plenary sessions and associated discussions in this Consultation will look at both the theology of church and the practicalities of developing healthy churches. We trust from this to derive principles that will inform and guide developments in our teaching courses and training initiatives. “Essence, Expression and Evaluation of Healthy Churches”. 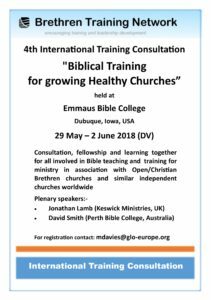 David Smith (Principal Perth Bible College, Australia, elder at Duncraig Christian Fellowship, and Chairman in Christian Community Churches of Australia) will be dealing with the specific ecclesiological considerations and challenges that face the Brethren movement. His own work has included the development of an evaluation process to help churches assess their understanding of the essence of what it means to be church, to build connected expressions of that in a local context, and to ensure the church is directed toward its goal—becoming all that God intends. “Growth with depth, honour and integrity”. 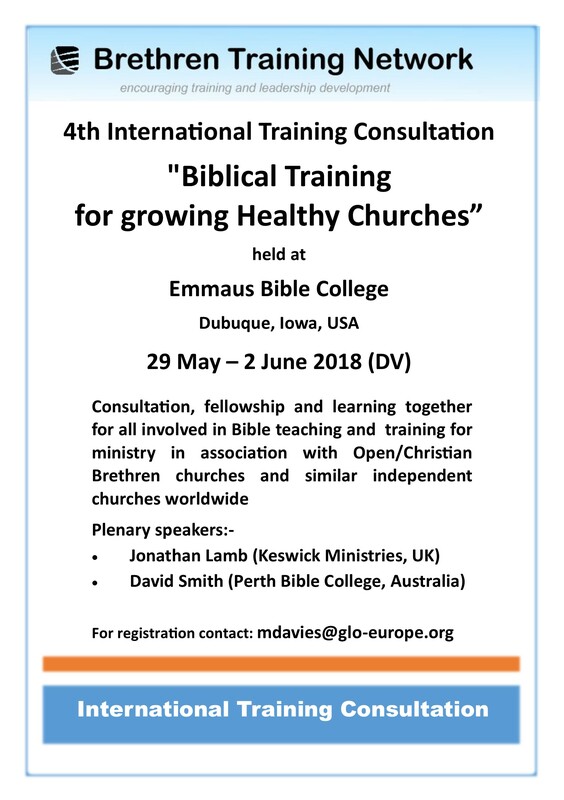 Jonathan Lamb (CEO Keswick Ministries, former teaching elder Belmont Chapel, Exeter, UK, and former Director of Langham Preaching) will tackle three key challenges in growing and maintaining healthy churches. The first is the problem of ‘growth without depth’, which has been one of the challenges in recent high growth areas of the majority world, but which challenges western churches too. The second is the problem of inconsistency—the lack of integrity in leaders and the lack of godliness in churches. The third is our struggles with division, or sometimes our inability to develop a doctrine of allowing difference in church thought and practice.